You can read the Escapist two ways. It's an excellent site about video games and related geek-culture topics such as movies and comics, with all the elements you'd expect: news, reviews, blogs, video and more. 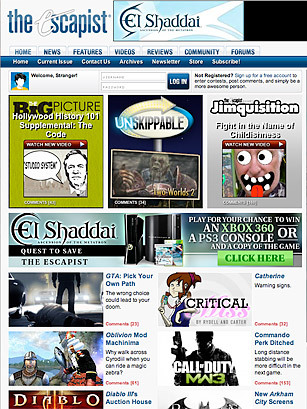 And it publishes a weekly online magazine that brings together articles on a shared theme, such as "Gamers vs. Developers vs. Publishers" and "The Industry's Seedy Underbelly." The Escapist isn't as highbrow or dignified as Kill Screen, but like that fine site, it's written for smart, thoughtful people who happen to love to play games.